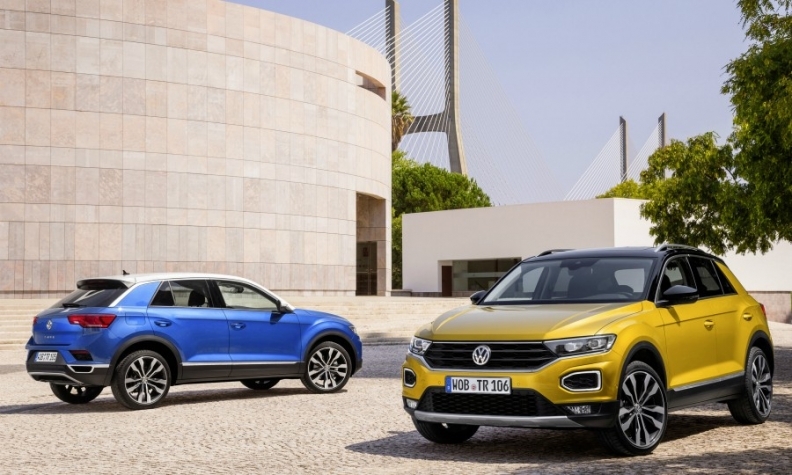 The VW T-Roc added more than 71,000 sales to Europe's small SUV segment, making it the fastest-growing sector in the first half with a 44% gain. SUVs and crossovers accounted for one-third of European sales during the first half for the first time. Their volume increased by almost 20 percent in a market that was up by just 2.5 percent. Only three non-SUV segments grew during the first six months. Driven by a 61 percent rise in demand for the second-generation Nissan Leaf, electric car sales grew by 37.7 percent to 105,736 units from January to June, figures from market researcher JATO Dynamics show. Strong performances from the Porsche Panamera, Audi A7 and BMW 6 GT boosted upper premium sales by 30.5 percent to 33,717 units. The Porsche 911, up by 77 percent to 9,338 units, and the Mercedes E class coupe, up 58 percent to 8,473, lifted the premium coupe segment by 3.1 percent to 68,438. 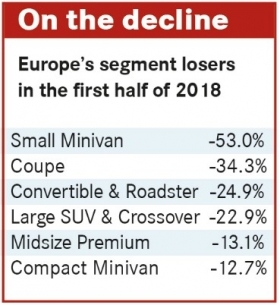 This surge shows that European customers still like premium coupes, while the volume coupe segment is slowly disappearing. Sales of coupes from mass-market brands declined 34.3 percent in the first half to 7,797, mainly because Volkswagen phased out the segment’s former leader, the Scirocco. This change allowed the Ford Mustang to take the segment lead despite losing 26.2 percent of its volume. The Mustang also accounted for nearly 49 percent of the ailing segment’s total sales. 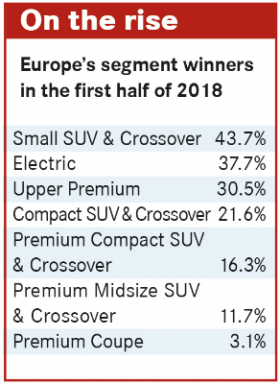 While these three segments were able to partially buck the "SUV-ization" of Europe, the shift to the higher riding vehicles continues to be strong. With sales up by 19.5 percent to 2.9 million in the first half, Europe's SUV and crossover market share grew to 34.7 percent. That was an increase of more than 560,000 units compared with the first half of last year. Small SUVs and crossovers were the driving force behind the surge, growing by 43.7 percent to 990,534 units. New models such as the VW T-Roc, Citroen C3 Aircross and Seat Arona helped their segment to account for 300,000 of the 560,000-unit increase in overall SUV sales during the half. The T-Roc was Europe's No. 5-selling small SUV, followed by the C3 Aircross. The Arona finished in the top 10. 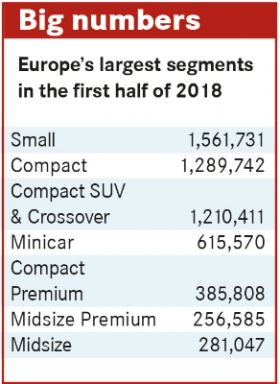 Compact SUVs and crossovers are set to become Europe’s second-largest segment by the end of the year. With a volume of 1.21 million units in the first half, the sector was 79,000 units behind current No. 2, compact cars. Compact SUV demand rose more than 20 percent during the half while sales of compact cars were down by 6.5 percent. A couple of SUV sectors, however, are heading in the opposite direction. The large SUV and premium large SUV sectors were down during the half. Customers started to avoid the models because of their size and higher fuel consumption figures.